Nonprofit organizations are institutions whose focus is dedicated to bring into focus certain social issues and bring them to light. Nonprofits are so named not because they do not earn profits. On the contrary, they do. It is just that they use their profits and revenue surplus to achieve and fulfill their objectives and goals rather than distributing said income to the organization’s shareholders leaders and members. For this reason, most nonprofit organizations are tax-exempt or charitable. This means that they do not pay income tax for any money the institution gets. Nonprofit organizations can operate in different sectors. They can operate in religious, scientific, research, or educational settings. Though no matter which field they operate in, nonprofits share one main problem and that is the problem of funding. As mentioned above, a nonprofit organization may be able to earn a small amount of money but this money is used fund the operations of the organization. More often than not, this amount will not be enough to cover all the cost of operations. A nonprofit’s existence then depends on donations and fundraisers. You may also see strategic plan samples. Donations have been sustaining nonprofits for years now. These donations may come from the pockets of individuals or foundations, may come in the form of sponsorship from different corporations, government funding, and merchandise sales among others. 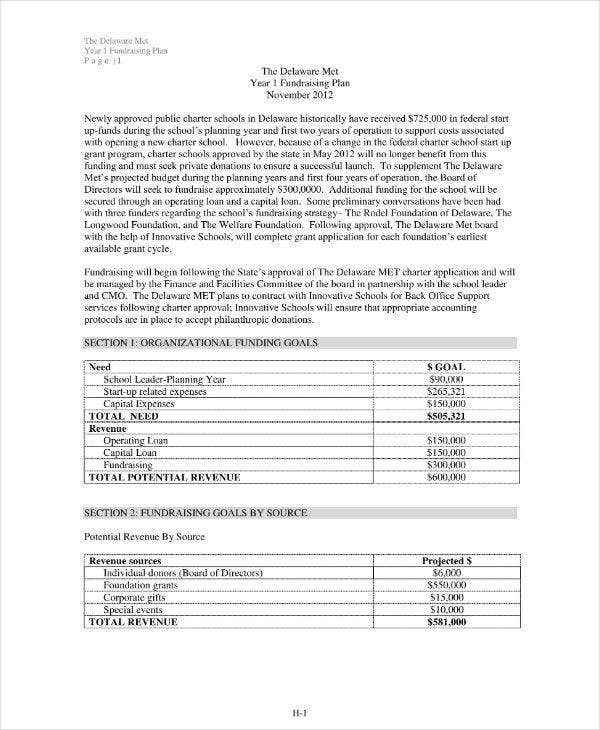 You may also see sample budget plans. However, not all of these income sources may be stable. Donations and sponsorship may change year after year. That company who sponsored your institution this year might find another worthy cause and focus all their funding to that organisation. Fundraising is an essential activity that all nonprofits do in order for them to survive. Fundraising will also be more successful with fundraising plans. 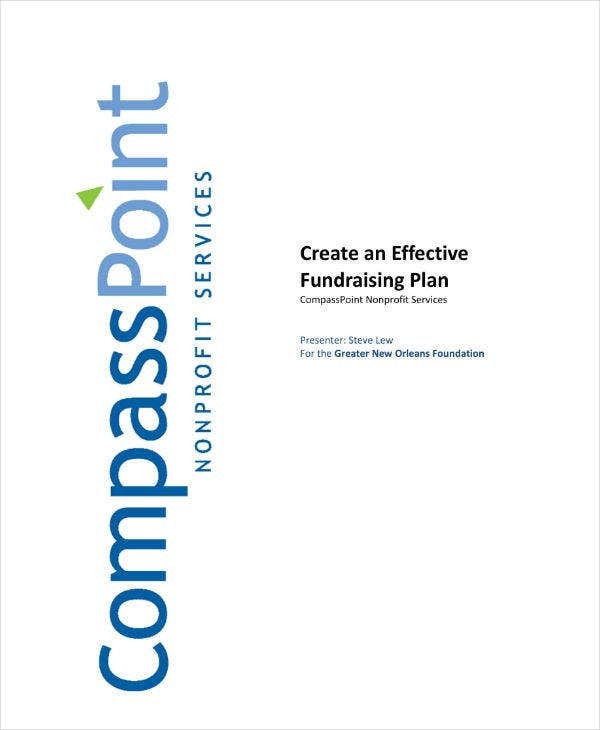 A sample fundraising plan is a document that organizes all of an institution’s fundraising activities over a period of time. 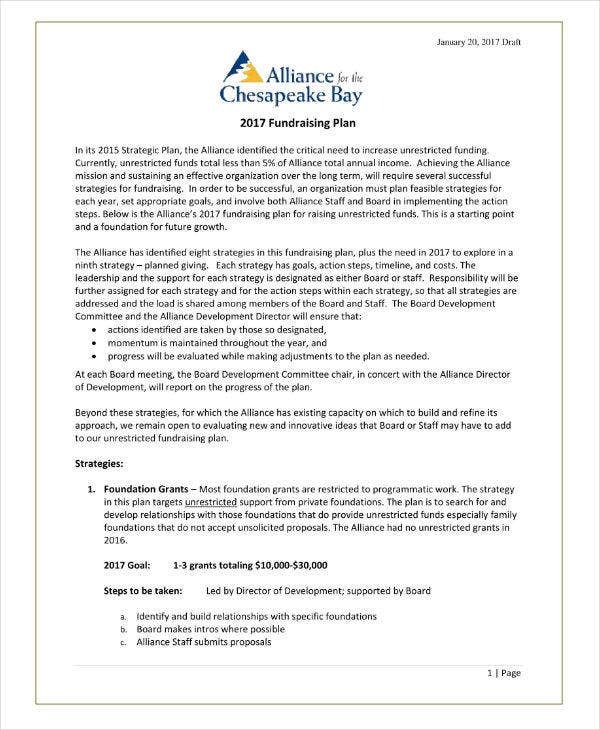 Usually, a fundraising plan is planned out for a period of one year. 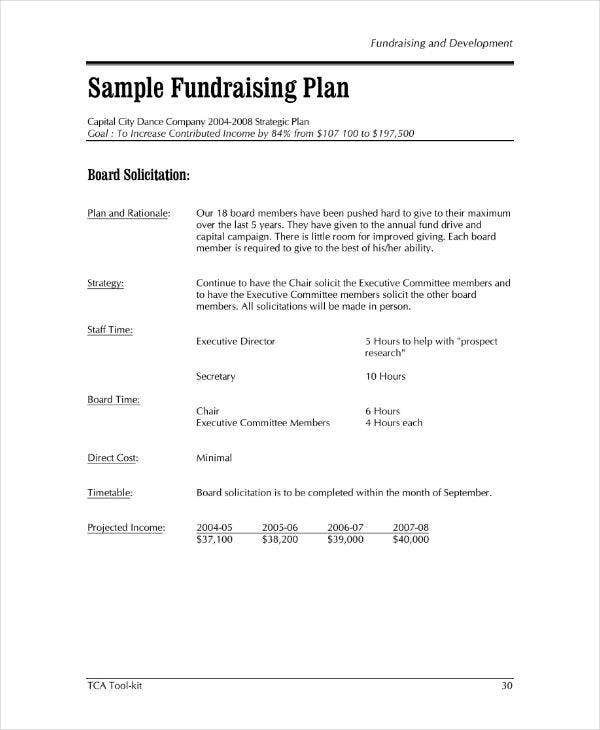 The general gist of a fundraising plan is that it usually includes campaign dates, strategies, donor-tracking plans, details on social events, and a targeted communication schedule. The ultimate goal of the financial plan is to be able to make and keep you focused on tasks throughout your fundraising year. 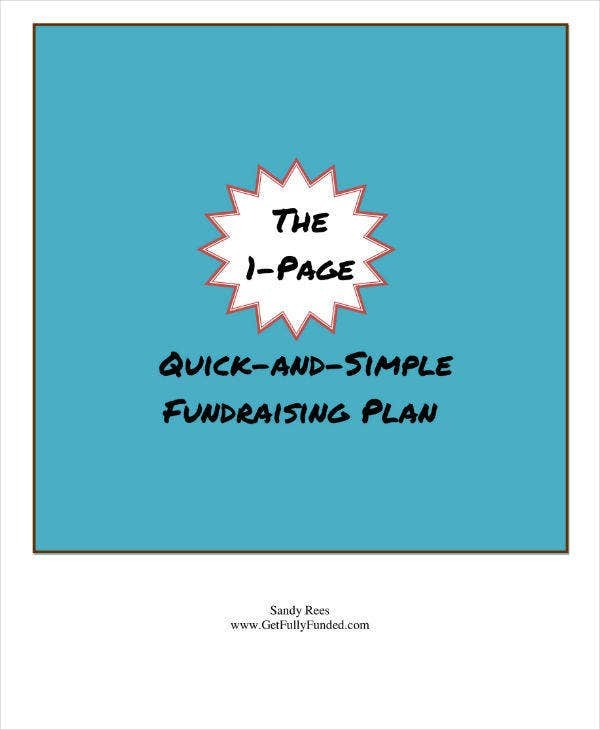 Like all plan samples, fundraising plans exist to help guide an effort. 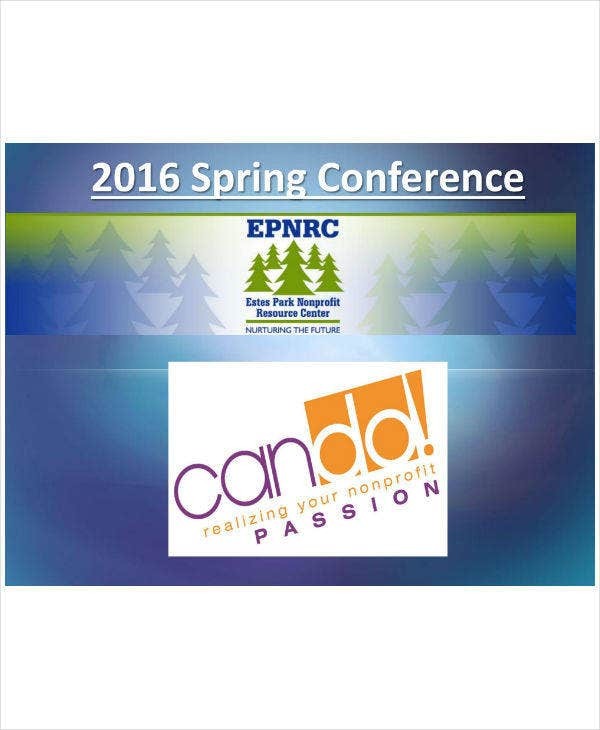 This time, that effort is geared to the fundraising activities for a nonprofit organization. As previously mentioned, fundraising activities have become essential for a nonprofit’s survival. Due to the growing number of nonprofit organizations the importance of having your fundraising already planned out allows or a better fundraising effort. A plan makes it easier for you to bring your organization to the same footing. Your organization’s staff, volunteers, and board members will be on the same page if you have a plan to show them a clear idea of your expectations on them for a certain period of time as well as the anticipated results. You may also see event plans in PDF. Fundraising can be a tedious task. Furthermore, a lot of people think that fundraising is a very conservative approach to secure funds. The documents that are involved in the fundraising process can help overturn those views. You may also see financial plan templates. Fundraising plans can clear out any misunderstanding in the organization with regards to the fundraising activity. A fundraising plan can provide a clear course of action especially if you have a diverse revenue stream. You may also see payment plan templates. Overall, no matter what you do, sample plans can and may help you in figuring out what needs to be done and how to proceed, especially in your times of need. It is easy to think that funds can only come in one shape, the shape of money. That view is expected really as this is really the things we see get raised when we first come into contact about fundraising. Money and grants are the most common results of fundraisers. However, fundraisers are also used to raise relationships between two business entities. Once this relationship level is high enough, they might be more willing to support each other. 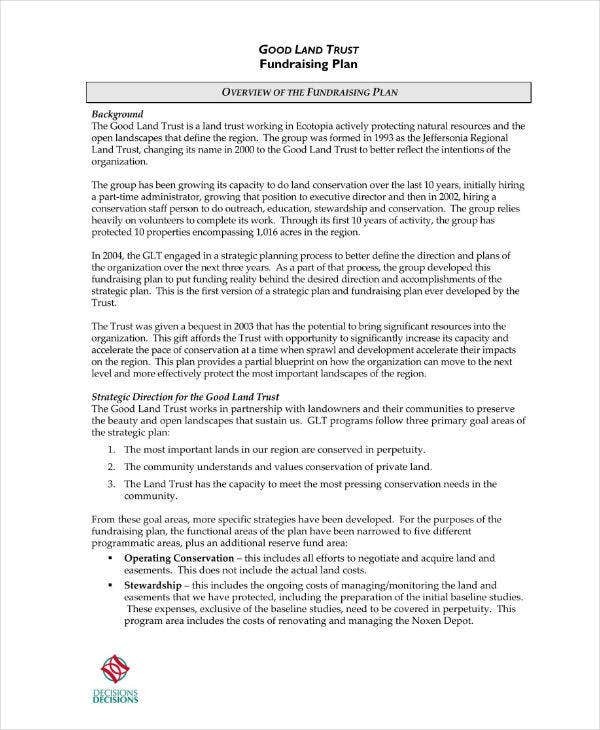 You may also see strategic plan templates. Formulating your fundraising plan can be a step by step process and each step should be tackled individually at a time. It is possible to not do this in such a manner. However, proceeding so can maybe confusing and can waste a lot of time during the process. 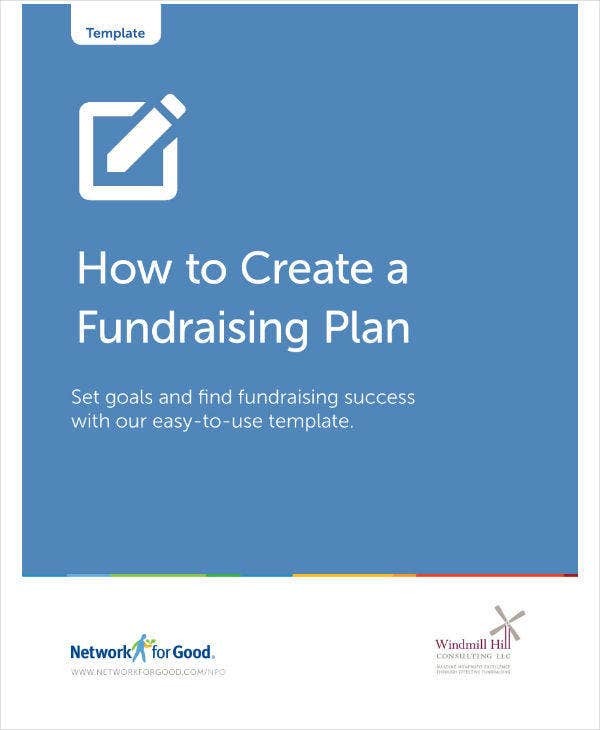 If you are just new to the fundraising process, then it is more advisable to follow the following steps in laying out your fundraising plan. 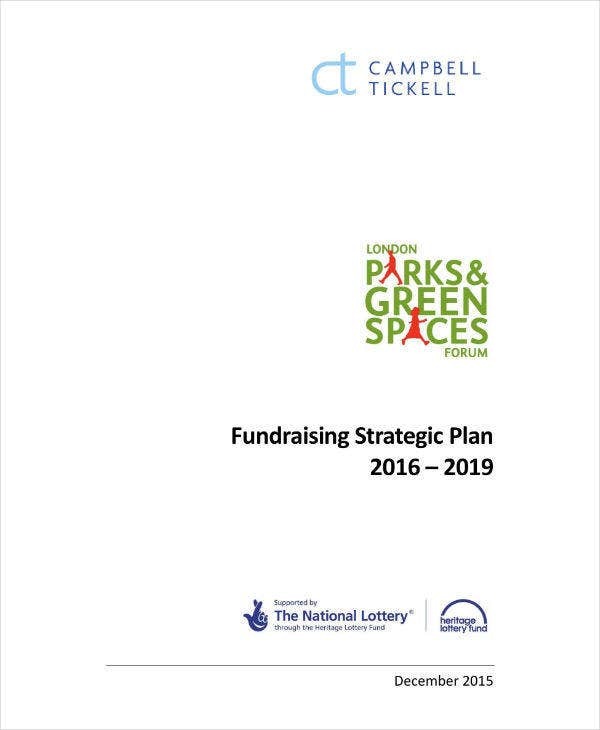 You may also see strategic plans in PDF. The first step of planning your fundraising plan is to define how much you want to earn from your fundraising and how you are going to allocate those earnings. It might be your goal to use the raised money for paying your overhead expenses, starting out new programs or as to pay for payments that are behind. No matter what you do, the funds you get will be for your institution’s cause. If you aim to have multiple goals, it is important to outline separate smart goals for each. You have to start somewhere when you plan to raise money. What better place to start by writing out your goals and projections for your fundraising year. 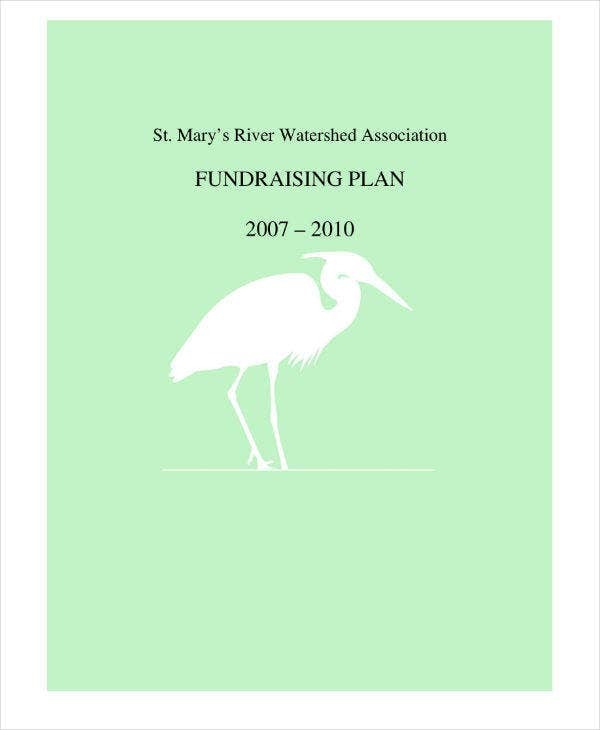 Having a written plan can help you avoid flying from one fundraising scheme to another. It is ideal to include in your fundraising plan the amount of money you plan to raise, the source of this money and lastly, your planned methods of acquiring this money. This plan can be revisable as you go along and when you need it as not all your plan will probably work out. A good place to start writing would be observing your current programs and their respective funding. You may also see project plans. Establishing a fundraising activity will not be free. Depending on your fundraising activity, the cost of running your fundraising event might be big or small. You should list down the projected costs of the whole event and see if it is worth it. Things such as postage, the cost to run a special event, personnel costs, should all be included among others. As much as possible, be cost-efficient when planning your fundraising event. Be realistic in your estimates. You may also see marketing plan samples. A good measuring stick as to how much you should spend on your fundraising event is to make sure that it does not exceed 25 percent of your total operating budget. 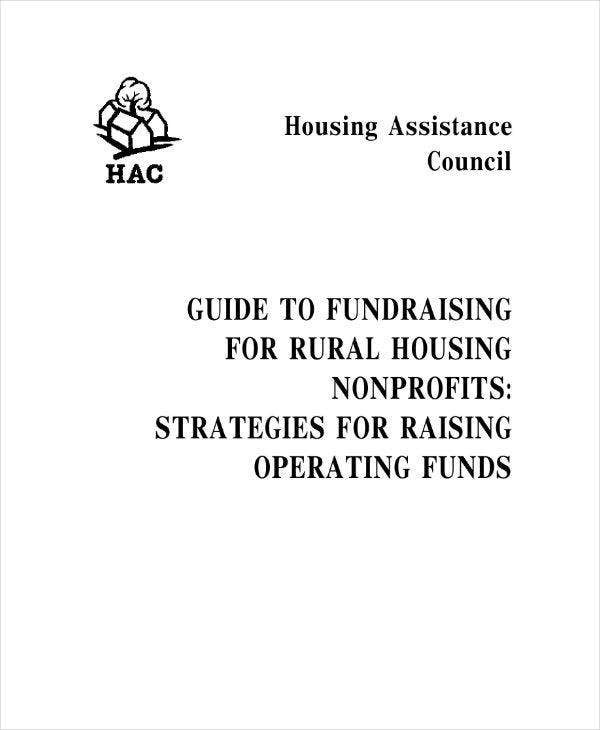 To put it simply, spend three-quarters of your funds in doing what you are founded to do and one-quarter for the fundraising and administrative costs. You may also see performance plan templates. As a fundraising plan is planned out for a period of one year, it will be a good idea to develop a timeline for your fundraising plan. Schedule your fundraising efforts by filling in a calendar with specific activities that can help earn the organization money. Also, include the people who should be responsible for each activity. You can expand on the timeline concept by developing a timeline for each fundraising activity, such as a special event. You may also see sample action plans. It is already mentioned above that along with your fundraising goals, you should also identify the source of these funds. You must plan ahead to appeal to your potential sources of funds. Ask yourself if the current source of funds and sponsorships can be leveraged for more income. Try to list out which audiences are untapped in their potential and engage them. Remember that these sources will not be forever, they might not even be with you next year, as such, formulate a plan on how you can retain your current donors. You may also see business plan templates. Like all the other kinds of plans, evaluation of your fundraising plan is key to your fundraising’s success. Evaluation will improve your results. As time passes by, you can use your evaluations as a way to refine your fundraising efforts and see which needs more tweaking. Try to do your evaluations after every few months. Develop criteria that you can use for this purpose, just make sure that this criterion is consistent. You may also see project plans. Nonprofit organizations or nonprofits for short, depend on donations and fundraising for their sustainability. Donations are less dependable than fundraisers as donors might choose to offer support to other nonprofits. As such, it is important for nonprofits to have an effective fundraising campaign to earn enough money and be able to execute what it is that they were founded for. 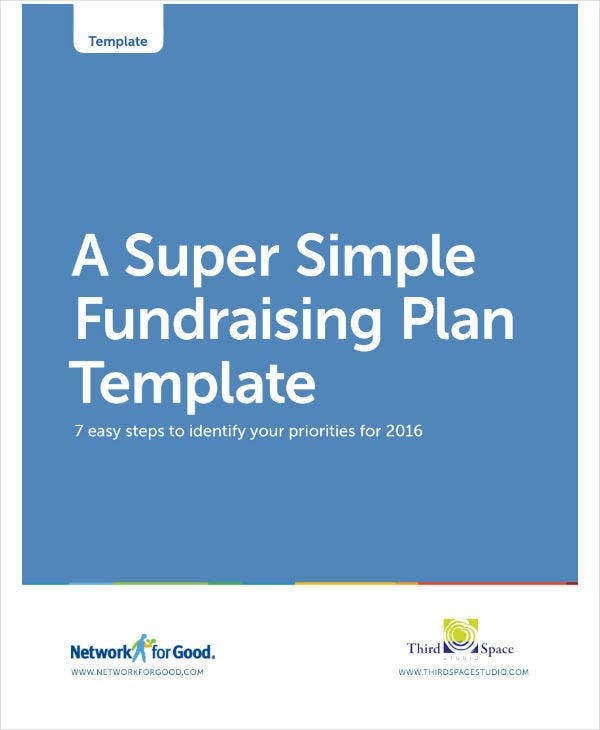 Fundraising plans are essential to ensure the success of fundraising campaigns that nonprofits venture in. You may also see sample work plan templates.